Recently, Ricardo de Candido from Fillmore Avenue Roundhouse shared several layout ideas that could be implemented in small spaces while replicating several basic railroad configurations (yard, junction, etc.). His junction proposal sounded good to me, but I knew many people wouldn't courageous enough to tackle the moveable staging sections. From there, I thought it could be interesting to see what could be done with a junction against the wall. From the beginning, I dropped the idea to operate both railway companies, deciding to focus on only one main carrier. However, I kept the interchange since it is a great hidden industry that can support all kind of traffic. My main inspiration was made up of several junctions in Quebec, mainly a mashup of Allenby in Quebec City and Farnham in the Eastern Townships. Another important inspiration is the junction was Fergus, Ontario, on the Elora Branch (on the CP Bruce Lines). I've often observed you can find somewhat large industries located near junction. Thus, I thought it would be neat to implement an interchange and a major customer. As presented, the layout would operate almost as the one layout turnout promoted by Lance Mindheim a few years ago. 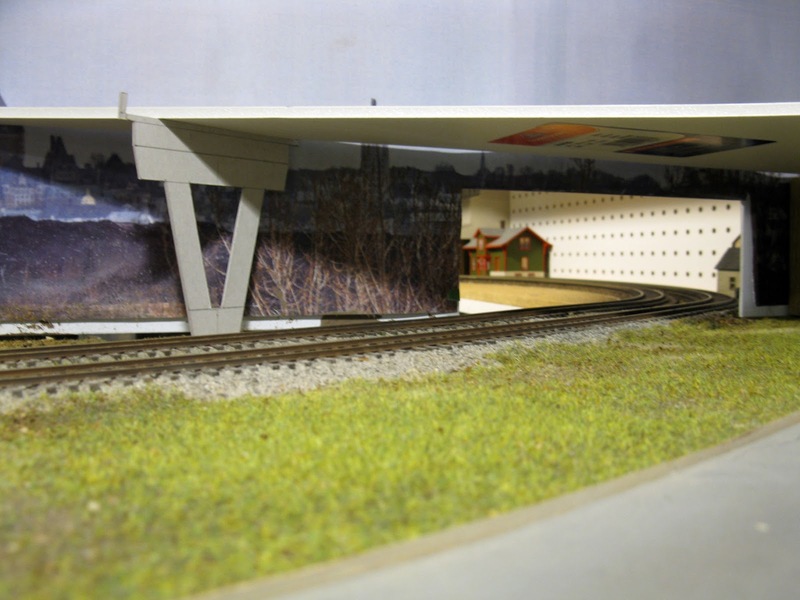 This small layout could be entirely modelled within a 18" x 80" area, maybe less. 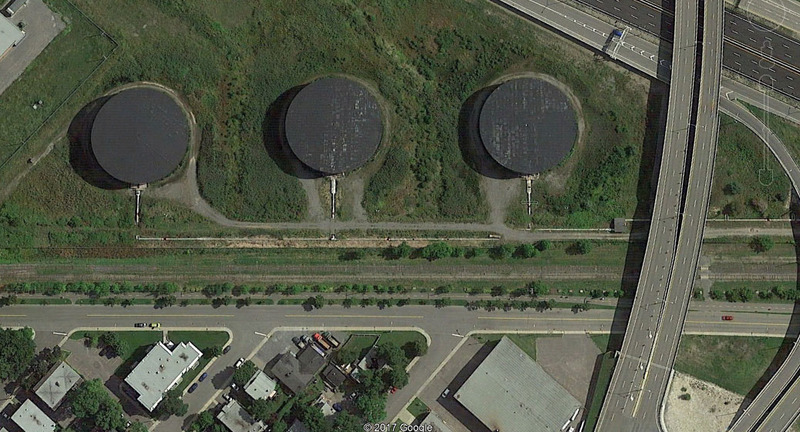 It would handle 4 to 5-car long trains and the customer would have 5 different car spots for interest and challenge. Add to that a staging cassette and you are in business. Meanwhile, I thought to myself if one would like to make the staging cassette, what could be done. First, you can simply scenic the cassette as a part of the layout. It would be neat and give a sense of space. An old depot could be implemented for the sake of visual interest and to geographically link the layout to a specific prototype. The second idea was simply to boost the layout a little bit. 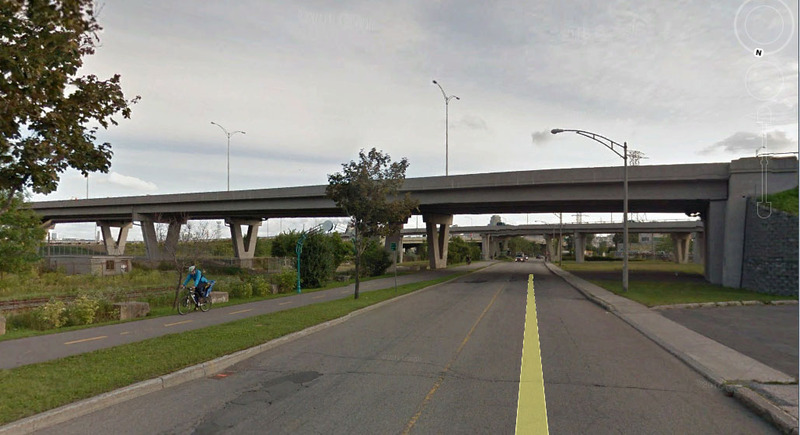 Looking at real interchanges, particularly in Joliette, QC, I decided to make the interchange longer and merging with a passing track. 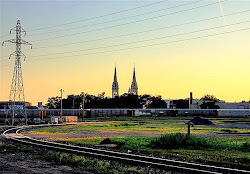 From there, the industry siding was connected. And since space was available, a second opposite siding was installed to take advantage of the runaround. This new customer could be anything, or be an extension of the first one, representing a very large plant receiving and shipping goods by rail. Finally, I added another track near the station. I could represent a branchline, a team track, whatever you want. It could be a neat place to stage a local switcher run. On the other hand, it could be entirely omitted. From an operation standpoint, it can be operated as a single switcher run, serving all the sidings at once. Or one could elect to operate the train in one direction then, during a later session, a train moving on the opposite direction. For reliability and realism, all switches are Peco code 83 #8. If one was handlaying his own trackwork, I think he could bump this up to #9 or #10 without too much problem. If space is a problem, the more standard #6 could be used though I think the gain is minimal. As for era or prototype, there is no limitation. I think any railway, industry and era can fit the bill. Personally, if I had to build such a scene, I would make it as generic as I could so I could alter easily the era and prototype to fit my mood. For the sake of planning, I had CP in mind, particularly during the 1960s. While it isn’t exactly the end of the year, there is very little time left to undertake any significant task on the layout at this point. As always, even if I didn’t have any expectations, our output wasn’t as impressive as I thought. Most of us were quite busy all over the year, which explained why we met more infrequently than usually. Also, and I’m to blame, my tendency to overthink every minor detail once again kicked back… but at least, I think I managed it better than usually. About the layout itself, progresses were slow but nevertheless significant. Ballasting and starting scenery in Villeneuve certainly improved the overall project and freed us from the Plywood Central syndrome. Experimenting with new ways of painting, weathering and ballasting track was also an excellent positive experiment. Once again, it proved us it was worth our time. Nothing was rushed and the results show off: it doesn’t look likes plastic. I still can see improvement in the future, but the foundation work is sound. In term of structures, 2017 was sincerely underwhelming. I wished the cement plant would be done by Christmas, but alas, it is now a 2018 project. Designing this structure is extremely complex. It could be done fast and dirty, however take in account details, accessibility issues and warping add an extra level of difficulty. Nevertheless, I almost found the solution and will likely implement it as soon as possible. From a layout design perspective, I also ventured into the other extreme, trying to oversimplify D’Estimauville for the sake of realism. As Simon Dunkley once cautioned me, it was a slippery road that was as fallacious as cramping out the place. The danger became evident when I reach the point scenes could no longer be recognized because they lost their personality. Like salt in a recipe, it was a matter of bringing out the taste. No salt would have simply meant a tasteless project devoid of interest. For this, I’m really glad Simon had the courage to clearly warn me. Not that it stopped me trying, but when I failed, I knew why and his words in my mind I was able to figure out what went wrong. You can’t learn without breaking a few eggs. Flattery wouldn’t have been any good for me. And this anecdote once again proved my late grandmother’s right: “the first idea is always the right one”. Looking back at my initial design, it was clear scenic elements were carefully balanced, thus I went back there. In terms of layout identity, I was surprised to discover a manufacturer would help make this project even better and closer to my childhood memories. Indeed, when Rapido announced their 3800ft cylindrical hoppers, it enabled us to build a correct fleet of cars to serve the cement plant. Before that, it was a matter of using stand-ins or older prototypes that didn’t fit the era. Finally, the future release of SW1200RS locomotives will enable us to replicate Chemin de fer du Québec’s three switchers that used to serve the line during a decade starting in 1993. Yes, the project shifted yet again in era, but it now reached a stable spot. CFC operations are well-documented and known. Their operation practices and train routes are also easier to implement on our layout. All in all, it simplifies the project around its core identity elements. Certainly we won’t drop completely CN trains, but focussing on CFC clear off the road from many unwanted issues. And also, we also reached the point we have acquired every piece of rolling stock required to run the layout… Hard to believe, but yes we did. Speaking of rolling stock, we learned the hard way this year to standardize the fleet (weight, couplers, wheels, etc.). We used to be negligent fellows, but at some point you hit a wall when you want smooth operation. Over the last few months, we had to teach us simple but efficient practices to make sure we could track down every bug. It’s not complete, but we can already see the positive results. Finally, 2018 will be the year the new Proto Throttle developed by Scott Thornton and his friends of Iowa Scale Engineering will be released. This new product is promising and the idea of coupling it with our NCE DCC system and Rapido SW1200RS could be extremely interesting. Our realistic approach to railroading and our track plan seems perfectly suited to such a ground breaking technological advance. Oh, and one’s gotta love the throttle’s vintage design. Finally, 2017 was also another interesting year for my other project Harlem Station. It allowed me to go back to building and bashing freight cars. I’ve learned a lot, improved my skills and took a strong commitment into freight car accuracy. I’m not river counter, but when you start understanding how real things are built and work, you naturally care about details other wouldn’t. Discovering the history of boxcar development between the early 1900s and the early 1950s was fascinating! Thus, at the end of the day, I consider the year was extremely positive in term of model railroading. I also tried to have an active presence on social media, but I must admit I’m not a fan. I loved the interaction with other fellow modellers, but I lack the regularity to take advantage of that. I’m a solitary man and it hardly fits my laid back pace. Blogs, forums and emails are still my favorite places to share and learn. Places where it is possible to hold a detailed discussion with a fellow modeller, archive it and revisit it from time to time. In the long run, instant gratification doesn’t hold long before it wears off. I hope people who wonder why I’m no longer following Facebook groups regularly can understand I’m hardly motivated using that channel. To me, model railroading has always been a “monastic” endeavour. A time of introspection and betterment. I’m less attracted by the idea of making friends for the sake of filling my social life than having a few deep discussions with like-minded folks. To each his own… this hobby has certainly variety for ever kind of people, which is great! I hope your own year was also a positive experience whatever your progress. 2017 was a gloomy year and finding solace in a positive and constructive hobby is a blessing. 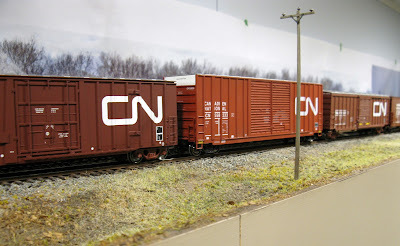 I certainly wish every model railroaders and other hobbyist are aware their passion is much more than a childish caprice. Never forget people without hobbies or personal endeavours are sad and often prone to distress. Consider your passion has a great gift, because your still is still alive and sparkling! The last time I played with Maizerets photo backdrop was 2 years and half ago. At the time, it was a temporary measure, a simple way to test out ideas. The result – though crude – was good enough to stay in place until now. However, scenery progress is going steadily and putting in place a final backdrop is no longer a luxury but an imperative need. While the actual backdrop is looking good, we decided adding the three large oil tanks in Maizerets was required. The original scale mock up did call for such iconic elements to be implemented. As I recently mentioned, we tried to create real 3D reservoirs, but it failed due to lack of space. There are limits to selective compression and thus, it was thought having the tanks printed on the backdrop would be much more suitable. My first attempt was to simply paste the reservoirs onto the backdrop in Photoshop. No surprise, the result was garish and unnatural. Thus, I decided to rather place them in background, behind the trees. Using various filters and selection tools, I was able to blend both images together so we could see the tank silhouettes visible through the leafless trees. And boy, did it worked! I can’t wait to try out the new backdrop and see if it needs adjustments. By the way, Marty McGuirk recently shared a story about a discussion with fellow high profile modellers concerning his future layout. As many of you know, Marty recently dismantled is large Central Vermont based layout recently before moving to a new house and many are curious to know what he's planning. While the new available estate would make many pale of envy, experience and wisdom made him take counter intuitive decisions like significantly downsizing his future project to better shape it according to his lifestyle, aspiration, resources and relation with the hobby... and then broking it into achievable parts. Far to be miserable, Marty's story retells us how framing a project into a reasonable set of parameters based on reality instead of fantasy is generally the best way to achieve success. Better, is step by step approach will probably help him to better gauge his enthusiasm and the merit of each of his design decision. Things are starting to settle down on the Villeneuve-D’Estimauville portion of the layout recently. As you have noted, we experimented with a few mock ups different road configurations to find out the best results. As a matter of fact, it seems my initial vision a few years ago was the right one. It may seem strange I focus my attention of roads, but I have a very practical reason for that. They must be built prior to many other scenic details since a lof of details depend on their proper location. But if I managed to get them done by the end of the year, I’ll be quite happy. We recently worked on Sous-Bois Avenue and D’Estimauville Avenue. But Saturday, we focussed our efforts on Maizerets, or more precisely, the spot where the tracks pass through the backdrop and disappear into staging. 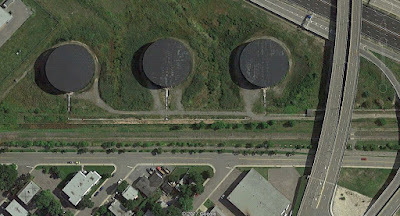 This is the proverbial place where you hide the tunnel with an overpass. 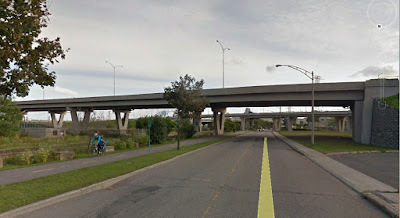 Fortunately for us, Henri-Bourassa Boulevard is located just there and, effectively, marks the end of Murray Bay Subdivision per se. 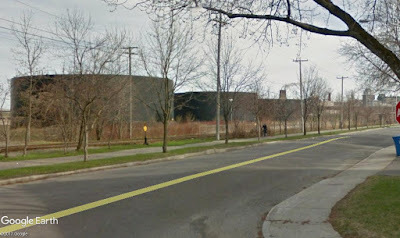 Henri-Bourassa Boulevard overpass, the pumphouse on the right. 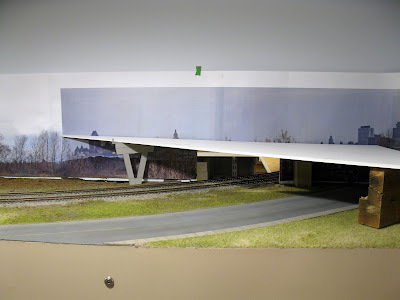 This overpass was planned for an early date, even before we rebranded the layout in the early 2010s. However, I postponed it for various reasons, but now it’s time to work on it. As you can see, it is a very spartan yet “attractive” concrete structure from 1974. By attractive, I mean the V-shaped pillars give it some character that immediately set the location. Also, on the left, the abutment is useful to create an effective visual block at the end of the layout. And, bonus, on the right, you will notice a small one-storey cinder block structure. This is the pumphouse for the large oil reservoirs. It is a mundane detail, but add the chain-link fence, the gravel access road and pipes and you get an interesting bunch of subtle yet effective details that real gives the industrial look of the area. For your information, we created a few mock ups to evaluate the possibility to create real oil reservoirs... but it failed. In term of size and space, it wasn't very effective. However, we found out building reservoir using a half-ellipse template created visually realistic tanks without wasting too much available space. Can’t wait until next week to build this nice overpass! As much as scenery can be a fun aspect of model railroading, any layout plagued with mechanical and electrical issue is bound to provide frustration for years to come. For this reason, we have continued to implement our standardisation program of rolling stock, motive power and track improvement, particularly brand new cars freshly out of the box and older ones that weren’t improved. Weight was added, wheel gauge checked and coupler height adjusted. To these basics steps, every wheel treads were cleaned with a steel wire brush on the Dremel motor tool to polish them and remove gunk. After a decade of use, many wheels were covered in dirt, paint and dullcote from weathering process. It was time to remove once for all that mess. It was also a good occasion to address a few boxcars that were tilting on their sides. After careful examination, it became evident the reason was simple: the bolsters and underframes were not properly sitting on the car floor. Removing excess glue and reassembling the cars too car of that problem, improving the performance and visual aspect of these boxcars. We also completed our new "cleaning car" based on the old tried and true trick of a Masonite under a boxcar. It serves well its purpose and was extremely useful for something it wasn’t designed: finding out spots covered in white glue and scenic cement. Every time the locomotive wasn’t able to pull the car over a stretch of track, it was a good indication the surface wasn’t clean and required some elbow grease to shine again. 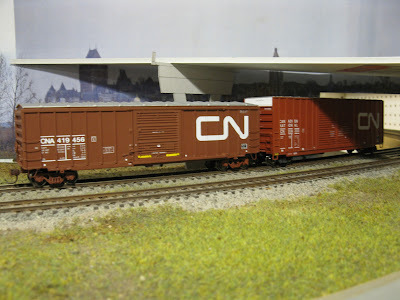 Finally, a last word about the re-released Walthers CN insulated boxcars (based on a FGE prototype). While the tooling is getting old (being first produced in the mid-1990s), Walthers significantly improved the old version with finer stirrups, more correct paint color and prototypical lettering. I also found out the roof assembly was improved. All in all, certainly not a bad car out of the box and well worth the money. From there, one can add some vents and other such details to bring the car up to today’s standards. As for myself, I’m rather satisfied with these new acquisitions that will support more bagged cement traffic in Villeneuve.